"Life never seems to be the way we want it, but we LIVE it the best way we can. There is no perfect life, but we CAN fill it with perfect moments..."
Brilliant! What a great way to think about the year past and look forward to the year ahead. Here I go again "waxing" philosophical, but I'm allowed, it's New Year's Eve! 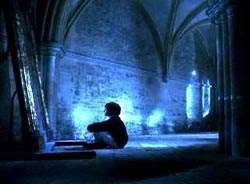 That is the Mirror of Erised from Harry Potter. and as Dumbledore explained, the Mirror "shows us nothing more or less than the deepest, most desperate desire of our hearts... the mirror gives neither knowledge nor truth and men have wasted away before it, entranced by what they see." Ok, so it's a fantasy children's story, but let's think about that for a minute. Men have wasted away looking in the mirror, entranced by what they see. We spend a great deal of time "looking back", Looking in the mirror, wishing for things that cannot be or cannot be changed. To get back to that quote about a perfect life, It is true. Life never seems to JUST the way we want it, but instead of looking back and longing for things the way they might have been, look ahead, see through the looking glass to the future. Live your life for those perfect moments. make those moments perfect for YOU. They won't seem perfect to everyone, but if they are perfect for you, that's all that counts. As I'm writing this, 2008 is just hours away from being done. If I can break my own thought and rule here, looking back, it has been an interesting year. I have had the absolute worst time of my life for reasons I won't bore you with now, and some of the absolute best times, 'perfect' times. In the end, they all balance out. I've made new friends that I can only hope will last a lifetime. I have lost friends that I miss every day. I have spent a wonderful year rediscovering just how much I love my partner- Ahmad, and just how much he means to me. I've created some great works, and some pieces of crap too! And so, that's it. I'm closing the door on 2008. I've read the last chapter, enjoyed the story and I am looking forward to beginning a new book titled "2009". "And there’s a hand, my trusty fiere !